If you’re heading to downtown Detroit to check out a sports game, concert or other entertainment event, there’s a good chance you’re going to the newest venue, Little Caesars Arena (LCA). I’ve been fortunate to attend some sports games at the new arena. I like that it brings more energy and people to downtown Detroit. The city is slowly but surely coming alive and I love all the fun to be had downtown. My friends and I visit often, whether to eat, drink, bike, explore or shop. Be aware there’s a LOT happening in a small radius. Three stadiums, many restaurants and bars, Fox Theater, Fillmore Theater and more. Within viewing and walking distance from each other. Cool, for many reasons. Crazy for others. Traffic congestion borders chaos well-orchestrated by the Detroit Police Officers directing vehicles and pedestrians during special events. The new Q-Line rails also need your attention when driving on Woodward. The arena itself is….big. It’s imposing and impressive in size (785,000 sq feet) and look, from the outside and inside. Multiple entrances welcome you (there are security and bag checks at each entrance). Once inside, it’s a bit of a sensory overload. Because you don’t just watch a game or concert. There are restaurants, bars, games, stores, picture stations, screens and more. A pure entertainment center. It’s an impressive architecture piece. Maybe I am one of the few old school fans who simply wants to attend a game to cheer on my team and enjoy watching the sport. I don’t need a ton of distractions, bars, or other to lure me. But, clearly, I’m not the majority because an entertainment center was built to welcome fans. I like the extra touches of trying to make the venue feel like home to hockey and basketball. 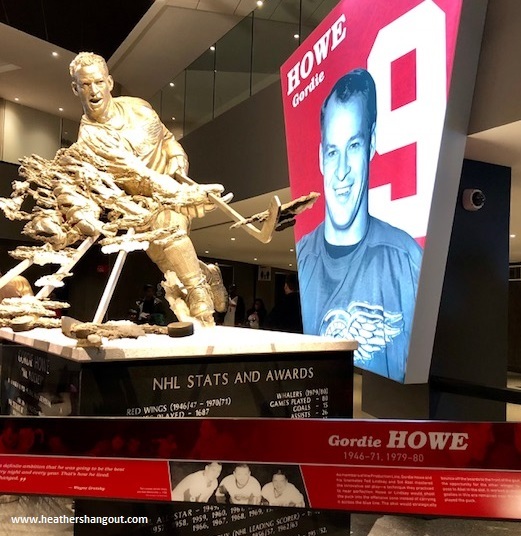 There are statues of hockey legends, like Gordie Howe and Ted Lindsay (these were at the Joe). Huge photos of Wings and Pistons players are hanging throughout. The old Olympia letters, once hanging at the Detroit Olympia, the Wings’ home from 1927-1979, now greet guests in the concourse. 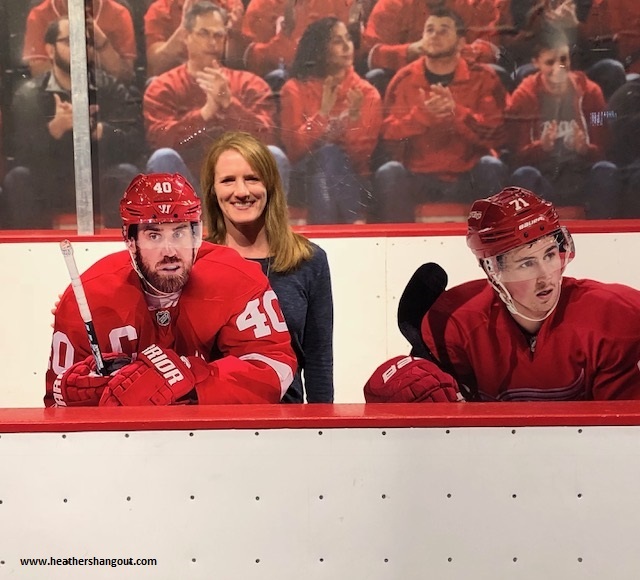 Fans can take pictures with a fun cutout of some Wings players on the Joe’s home bench. I’m a big hockey fan. Living in the Detroit area, I am, of course, a Detroit Red Wings fan. I watch them on television and love going to live games. I am probably one of a few who liked Joe Louis Arena, aka The Joe, the Wings’ former home. Yes, it was old, smelly, cozy, often too warm, and you either walked up a lot of stairs or passed through a tight corridor with thousands of people to get in and out. But it was home to Hockeytown. As a hockey fan, I like to watch some games in person each season. Of course, I was going to check out LCA. My first visit was in September for a preseason game against the Toronto Maple Leafs (I’ll leave out how the game ended; sniff, sniff). I had no idea what the venue looked like or how seats were arranged. I found a great deal on upper seats. You could see every aspect of the rink. But I was really surprised at the location of the press box to the seats. If you’re in the upper rows of the 200-level seats, you are actually sitting behind the press box seats. You have a clear view of the rink, but the scoreboard, banners, other seats and some screens are blocked from view. There are television screens on the back side of the press box that show the same clips as the scoreboard, but it’s still odd that they blocked the full arena view of so many seats. When we first arrived for the preseason game, most of the televisions were off near our section. A guy sitting next to me went downstairs to complain, and a few short while later all the TVs turned on. The next time I attended a Wings game, I avoided that section and sat more central lower. I, of course, paid more for the tickets but the seats were unobstructed with a full view of the rink, scoreboard, banners and all. And the outcome of the game was much better (yes, we won). You’ve probably heard of the steepness of the seats. It’s true. I cringe at the thought of someone consuming too much alcohol and walking down those stairs. I saw a child trip going down the staircase and three people grabbed at him to stop him from tumbling straight down. It’s a joke among attendees that once you’re seated, you’re kind of stuck because it’s a lot of effort for everyone to let you pass. And if someone does need to pass, lean back when you’re standing so you don’t accidentally knock them over. Seriously. The seating arrangement is snug. Supposedly, the seats are a bit wider/bigger than the Joe’s seats, but if so, barely. You feel your neighbor in the seat beside you. The cup holders are low (and black) and the aisles snug, so I recommend holding your drink if anyone in your aisle needs to pass your seat, or risk having someone accidentally kick it (as happened to a friend). As we wandered the concourse checking out the old school photos and sculptures, it dawned on me that LCA is also home to the Detroit Pistons. Then I started looking for notice of our basketball team, finding pictures of Isiah Thomas and others, Pistons signs and other gestures to the team. Banners for both teams hang in the rafters, highlighting the amazing players and team victories that our city has celebrated for decades. But I still feel like the arena definitely breathes hockey (I love it). Now I was curious what the arena would like for a basketball game. I went with a group of friends a few weeks ago to check out a Pistons’ game. I admittedly am not a big basketball fan, at least not for many years. You certainly know there is a hockey presence, but the balance is better. 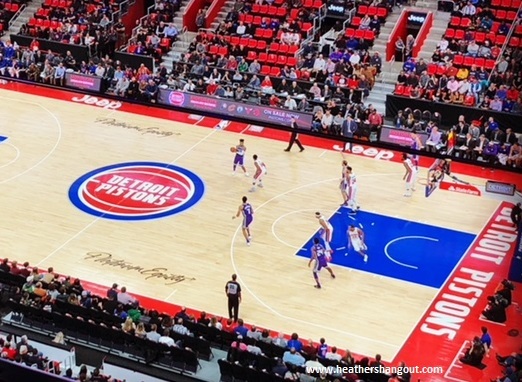 Obviously, the Wings’ symbol wasn’t on display on doors and the workers wore Pistons’ logo. The rink was transformed into a court. I again don’t think there’s a bad seat for watching the action on the court. The steep seats make certain there are good views. And that scoreboard – huge (second largest in the NHL). If you attended a Pistons’ game at the Palace, you may understand when I say that I felt it was cozier and a bit more welcoming than LCA. I guess it’s hard to describe the cozy feeling, although every person in my group agreed with my sentiment. The downside is it’s expensive. Tickets are pricey for two teams that need to greatly improve. Food and drinks are costly. I’m in awe of the families attending the game; I can’t imagine what they spend to attend a game. I personally think sports have become expensive in general. But that’s a soapbox for another day. My favorite Wings’ games to attend are the ones against our Canadian neighbor teams. With our close proximity, there are many fans who cross the border for the game. I, sadly, lost a bet the last time we played the Maple Leafs so let’s hope we do better when we next host our neighbors! Overall, it’s a nice arena. There are some impressive features and I appreciate some of the architecture aspects. Will I list it as a favorite arena? No, at least not yet. Will I attend another sports game or concert? Yes, because I like my teams. And that’s probably all the LCA owners want to know.